LiveU to showcase its new LU710 4K video encoder. Singapore, May 2016: At BroadcastAsia2016, LiveU will present its full range of live video acquisition, management and distribution solutions over IP and latest additions to its portfolio. 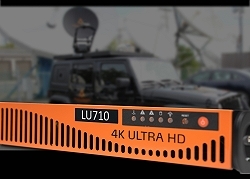 LiveU will showcase its next-generation LU710 4K/p60 rack-mountable 1U encoder. Delivering superior video performance, the LU710 is fully integrated in the LiveU ecosystem via the LiveU Central browser-based management platform. LiveU will demonstrate its new plug-and-play live streaming bonded solution for the online media market, LiveU Solo. LiveU Solo allows users to live-stream seamlessly into any web streaming workflow by connecting automatically to popular content delivery networks such as Facebook, YouTube Live and Wowza Streaming Cloud™. Solo is simple to manage and control remotely via a web interface or smart device. Full product demonstrations will be available at Stand 5H2-04.